I’ve had this tea blog for a few years now. But I’ve loved tea for a lot longer. I think the first time I ever had tea (that I can remember) was while working on a project in middle school. We were actually making tea to use to discolor a piece of paper and make it look old. We ended up having some leftover, so I tasted it, and I knew this was my drink. I know some say that black tea is an acquired taste, like coffee, but that wasn’t the case for me. It was love at first sip. Afternoon tea with good friends Diana and Shannon in May 2015.
college, I started to expand my horizons. The Christmas of my freshman year, my mom got me some blends from Teavana, including pineapple kona pop. After discovering there were so many kinds of tea out there, I began wanting to try more and more blends and the interest just grew from there. Shortly after, I went to my first afternoon tea with my friend Misha of Ambitious Mix, at a cute little tea room in Rochester, Mich. I’ve been to a few since then. I just love the experience of sitting down for tea with a friend or loved one. 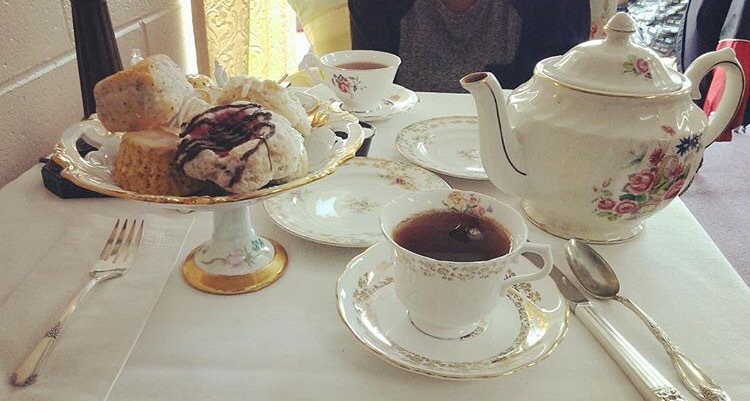 For example, most of the times I return to Michigan to visit, I head over to a Just Delicious Scones & Royal Treat Tea Room with Rachel of Life of a Female Bibliophile, to catch up over tea and scones. And my friend Clare and I love to trade teas when we find something we really like. And also the time my boyfriend, friend Julianne and her man Mike all went for a tea tasting really stands out in my top tea experiences. Many of my favorite memories include tea. Right before I graduated from college, I started this blog, and it’s inspired me to try more teas whenever I can. My interest in studying teas has grown, and I’ve learned a lot. That brings me joy, but there’s still so much more to learn. From black, to green, oolong to rooibos and herbal teas, I really do love them all. I am not alone, since tea is the most consumed beverage in the world (back in college, I did an article looking at the growing trend). I haven’t tried many I don’t like — except those that are overly sweet. And tea has given me so much — a shoulder to lie on and a cup to cry in through the difficult times, but it also makes happier times even better. And it’s really a social experience to try tea with others and bond over the leaves, or talk tea with someone new.